Alinor sits along the Oleander Coast, the southwestern coast that runs as far as Rellenthil in the north. Alinor is built along a slope from the southern mountains of the Summerset Isle. The outskirts of Alinor are riddled with vineyards made for the Oleander Coast Winery, a prevalent winery found on the Summerset Isles. The vineyards may not be as expansive as the ones in Russafeld, but they are in bountiful rows found between the city walls and the main road. Along the main road towards Central Summerset, between Alinor and Rellenthil is the fortress of Cey-Tarn Keep and the Alinor Docks, both proved to be substantial to the nearby capital. Cey-Tarn is utilized as a defense from the west, ideally from the Maormer or even the Sload. While the Alinor Docks is where transport and trade from the seas come into Alinor or the nearby settlements. There are other sights found around Alinor's general area, such as the Vaults of Heinarwe in the mountains, or the island of Wasten Coraldale which is found off the coast. Alinor is neighbored by several settlements, including Marnor Keep in the southeast, and Riverwatch in the northeast. Alinor is a heavily walled-off city, built atop a stone foundation considering the geography around Alinor. The streets are somewhat narrow, towered over by tall buildings and filled with tall bright street lights. Southern Alinor has a river running along the streets from the mountains, and into the sea. The Golden Gryphon is one of the inns located in Alinor, and the Temple of the Divines can be found towards the central plaza, known as Rinmawens's Plaza. Along the river is a marketplace, and across from it is the Plaza of the Hand, where many artisans and craftsmen create weapons and armors. 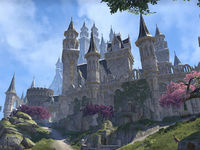 Continuing southeast eventually leads into the local Mages Guild, and eventually the Royal Palace of Alinor, where the monarchy of Summerset lives to rule over the province. Alinor's early history is unknown, but it has always been the capital of the Summerset Isles, having a troubled history with the city-state of Lillandril amidst an undocumented era of history in the Summerset Isles, during the First and Second Era. The High Kingship of Alinor is held at the utmost regard to the High Elves, and at one point even their cousins the Ayleids. In fact, the White-Gold Tower was made in tribute to the then High King of Alinor. During the Merethic Era, the Sun Birds of Alinor were known for their attempted expeditions beyond Nirn, and into the realms of Aetherius. Even as far as the late Third Era, the Sun Birds' exploits were one of the most famous attempts to Aetherius recorded in history. As time went on, the Summerset Isles has allowed foreign interest into the province, only for them to later recline that decision. Most foreign interest on the Summerset Isles was only delegated to the city-state of Alinor. 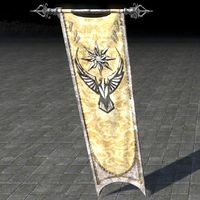 Among the early documents of Alinor for the mainland come from human traders and ambassadors, such as Eric of Guis, who served as an Envoy for the Second Empire, during the reign of Reman Cyrodiil II. In the Interregnum, the city-state of Alinor was ruled by Hidellith, alongside his wife, Kinlady Tuinden. High King Hidellith's reign over Alinor and the Summerset Isles lasted for quite several years, showcasing the best traditions of Elven Ceremoniarchy, basing every decision on the information that was precedented on the Scrolls of Praxis. In 2E 486, a small fleet of Maormer was spotted off the coast of Alinor, and so King Hidellith ordered his navy to give chase to their homeland of Pyandonea, however, all but one of their ships was able to return intact. Hidellith's heir, Ayrenn was born at a most auspicious time, as well as, being named as the Praxis dictated. Ayrenn was born on the 5th of Second Seed, in 2E 555. On that day, all of the Summerset Isles, including both Auridon and Artaeum, celebrated her birth for fifty-five days. When it came the time, for Ayrenn to study at the Sapiarchs' Labyrinth, she disappeared off the Summerset Isles and set forth for a life of adventuring on the mainland. King Hidellith resumed his role as the High King until he passed away in 2E 580. Upon hearing the news, Ayrenn returned to the Summerset Isles and ascended as the High Queen of Alinor. Following her ascension to the throne, the city-state of Alinor was inducted into the First Aldmeri Dominion. However, with the capital of the alliance being the city of Elden Root, Queen Ayrenn was forced to leave Alinor, and so in her place was her cousin, Alwinarwe, the Proxy Queen of Alinor. Sometime around 2E 583, Queen Ayrenn had issued a decree that allowed foreign interest into the Isle of Summerset, and so a new wave of immigrants came to Alinor and other Summerset cities. At around the time, a Daedric plot was brewing on Summerset Isle, between the combined forces of Clavicus Vile, Mephala, and Nocturnal. An associate of the Psijic Order needed the Proxy Queen's permission to enter the College of Sapiarchs, in order to warn the Sapiarchs about the impending threat. But even with her permission, it proved to be in vain as the College was later ransacked. When Nocturnal's cult had taken over the Crystal Tower, Razum-dar of the Eyes of the Queen left for Alinor to protect the city, along with Summerset from a Daedric catastrophe should the events at Crystal-Like-Law go in favor of Nocturnal. Fortunately, Nocturnal's plot was stopped and the Crystal Tower was saved. At the Alinor Royal Palace, both the Psijic Order and the Sapiarchs decided to form an alliance to protect the Crystal Tower from future threats. During the Imperial Simulacrum in the late Third Era, the city-state of Alinor was ruled by King Coreriil, when it had a rivalry with the city-state of Lillandril. In the aftermath of the Oblivion Crisis, the province of the Summerset Isles was renamed to Alinor. Elante, an archaeologist with a scholarly interest in Daedra, was from this city, as was the author Camilonwe. This page was last modified on 6 March 2019, at 16:51.